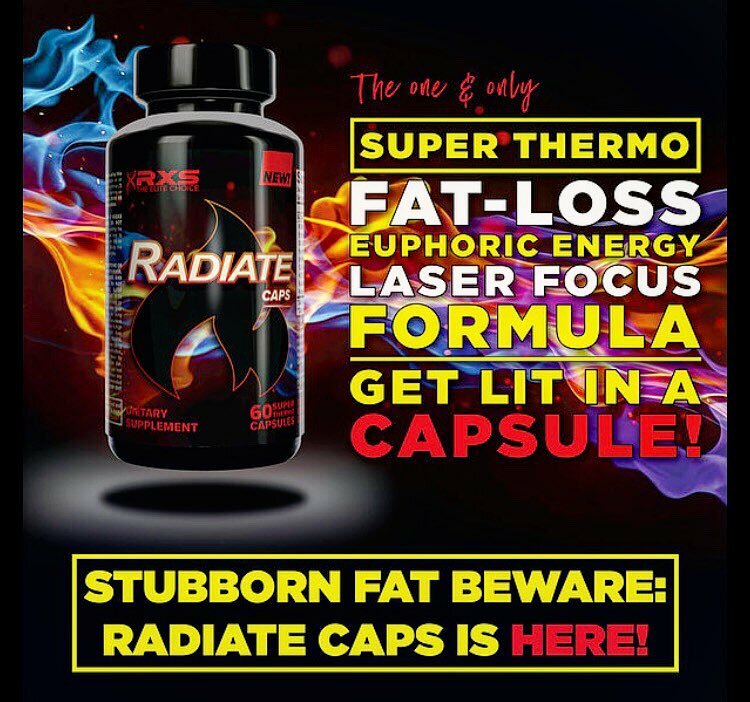 RXS Supplements provides the solution with the new capsule version of RADIATE, and for a limited time we have a killer PRICEPLOW coupon code below! The Radiate Fat Burner lives up to its name… epic PricePlow deal available on this one! The industry mainly pushes two different archetypes for fat burners at the moment: the “feel good” archetype and the “stim-heavy appetite suppression” archetype. Neither is superior to the other — some people find their stress levels skyrocket on a diet and could use a boost in the mood department. Many people would prefer having their appetite reduced to a significant degree, and energy to cope with that. At first glance, we would put Radiate into the “feel good” category of fat burners. But ultimately thanks to a few other ingredients… this product lives up to its name with a truly thermogenic feel to top it off, as explained in our ingredient analysis below. Use coupon code PRICEPLOW at RXSSupplements.com for 20% off! Another common stereotype of fat burners are proprietary blends. Prop blends everything. There are too many fat burners on the market that list a slew of ingredients without telling you a damn thing about the dosage. This is a problem, especially if a supplement is stimulant heavy, and we always ask companies to reveal as much as they can so you don’t get over-stimmed. It looks like a proprietary blend… but it’s not! See how all of Radiate’s Ingredients are disclosed! Oh yes. Ashwagandha is probably the best supplement on the market for stress reduction and, in my opinion, even can stand toe to toe with some pharmaceuticals. It’s anxiolytic, or anxiety killing, action is accomplished by a reduction of cortisol. Since cortisol raises as you lower your calories, this will be amazing for your cut. The best part? 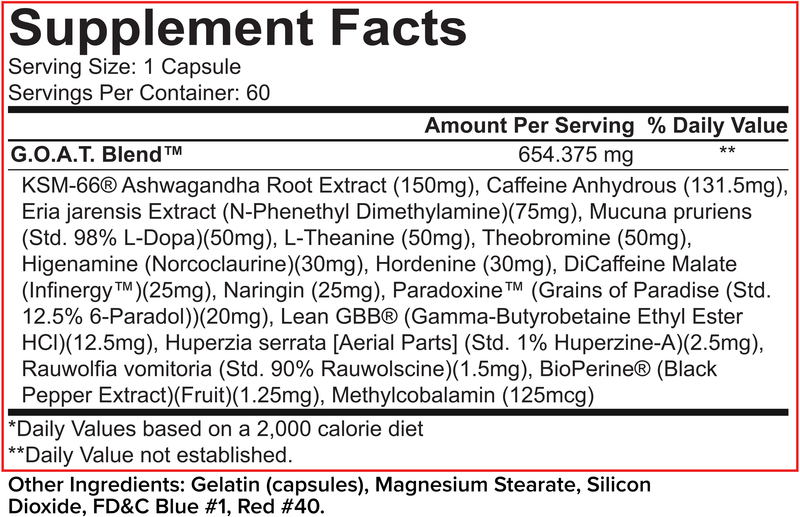 KSM-66 Ashwagandha is dosed around 300-500mg a day. By taking Radiate twice, you have your clinical dose. Flawless execution of a great ingredient, and in an effort to replace DMHA from the old powdered formula, this was a great addition to replace the “feel-good” side of things! An ingredient that needs no introduction. Caffeine is perhaps the best thing you can take for energy on a diet for a slew of reasons. It may increase your metabolic rate throughout the day as well, allowing you to burn more calories. The dosage in Radiate is great if you plan to take more than one dose of the supplement a day. The KSM-66 and L-Theanine also present in Radiate will make sure the caffeine doesn’t make you anxious. An ingredient Priceplow has a special love for. Eria Jarensis Extract, typically extracted for its N, N-Dimethylphenethylamine content, is another variation of the PEA ingredient, but built to last a bit longer thanks to its structure. We wrote about it at length here if you’d like more info. For this article, just know it’s a great stimulant that’ll have you feeling real good, and its combination with KSM-66 ashwagandha makes for a very suitable DMHA replacement. L-Dopa is another feel good ingredient. In the body, it winds up driving up your dopamine levels. It also has been shown to reduce cortisol and improve your overall well-being. [5,6] While the dose here is low, repeated doses up throughout the day will definitely help you feel nice. 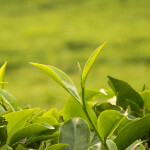 L-Theanine comes from tea leaves, and pairs very well with caffeine offset any potential anxiety. 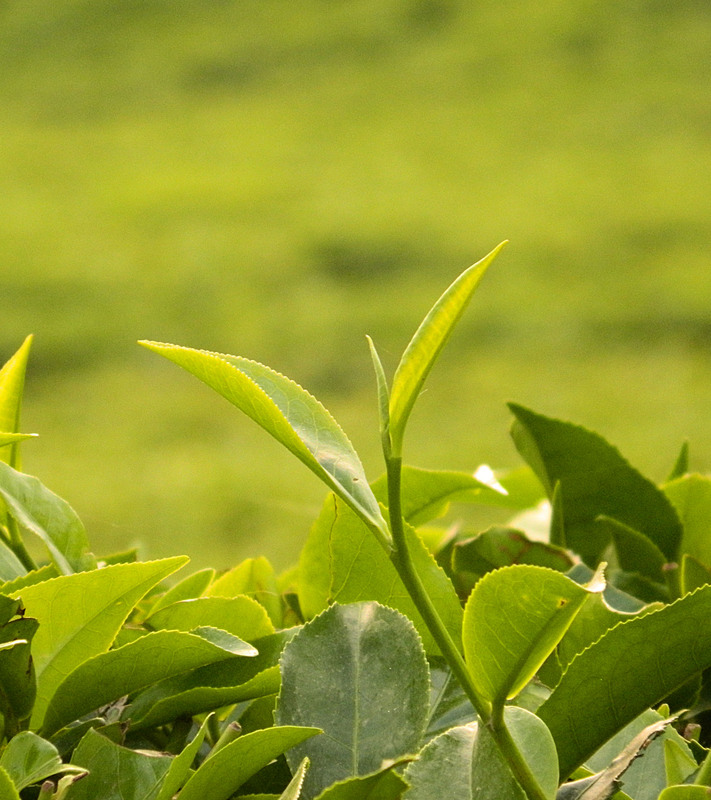 L-Theanine might as well be caffeine’s better half. L-Theanine has great synergy with caffeine. L-Theanine makes caffeine work even better by reducing the jitters and anxiety associated with caffeine. The L-theanine/caffeine pairing is also one of the most safe and recommended nootropic stacks on Earth. Our “requirement” we have for formulas is simply that there’s less L-theanine than caffeine, and we’re good to go here on that front. Reason being, too much of this ingredient makes things a bit too calm! So this 1:3 theanine:caffeine ratio is perfect for someone who’s looking for that clean energy but not too chill! Theobromine is a secondary stimulant found in coffee beans. While it very much like caffeine structure, it’s less potent. This is helpful in the Radiate formula. Theobromine in a fat burner will give a smooth and less jittery stimulant experience that’ll make your buzz last longer. Boom.. another aspect of Radiate designed to stimulate you while making you feel good. 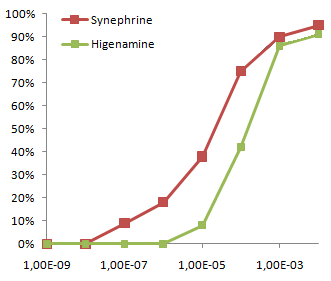 Higenamine activates beta-2 adrenoreceptors nearly as well as synephrine, but has less side effects. However, note that most research uses 50mg, and we have 30mg here. However, it is banned by WADA (mostly due to its bronchodilator abilities rather than its beta-2 stimulant activity), so if you’re a drug-tested athlete, Radiate is off limits. Most of us aren’t. Hordenine is an MAO inhibitor. Since MAO is the enzyme associated with PEA metabolism, hordenine is thrown into PEA-based supplements here for one main reason: it’ll make the Eria Jarensis last longer! But as a secondary benefit, it may also help you free up fatty acids since it acts as a beta-2 agonist. Di-caffeine malate provides all the benefits of caffeine anhydrous. The main difference is that Di-Caffeine malate stays a little longer in the body. Di-caffeine malate is around 75% caffeine by weight. 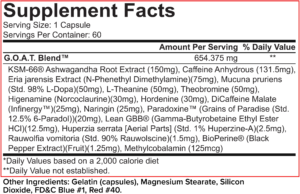 It’s presence in Radiate brings up the total caffeine per dose to 150mg – not too shabby! It should help stave off any nasty crashes, along with the KSM-66 and L-Theanine. Naringin is a polyphenol found in grapefruit that may help with weight loss. However, it’s likely present in Radiate as an energy booster. 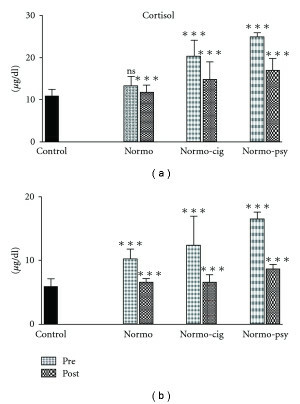 This polyphenol has a unique ability to inhibit phosphodiesterase (PDE) enzymes, which inhibit natural energy production. Since Naringin is stepping in to slow the roll of those PDE enzyme, Radiate should definitely enhance your energy during the day. This chart applies to a two capsule total per day Radiate dose. Energy expenditure change (ΔEE) after oral ingestion of grains of paradise (GP) extract and placebo. ΔEE before (0 h) and after oral ingestion of 40 mg GP extract (●) or placebo (○). (a), (b) Δ EE, (c), (d) ΔEE adjusted for fat-free mass (FFM), (a), (c) brown adipose tissue (BAT)-positive group (n 12), (b), (d) BAT-negative group (n 7). Paradoxine is a patented Grains of Paradise extract. Long term fans already know how much we love this stuff, as we’ve been writing about it for years. Grains of paradise helps you burn fat through brown fat thermogenesis [14,15]. The best part? It does this without leaving you stimulated or jittery. It’s one of the best light-stimulant supplements available on the market. Now this is a fun ingredient – especially if you’re cool with some thermogenesis (and if you’re researching a product named Radiate, we imagine you are)! Lean GBB is a cool way of supplementing carnitine that’s new to the diet industry. Carnitine has bad bioavailability issues, only about 14-20% of what you take is usable. Lean GBB gets around this by promoting natural carnitine production to the tune of nearly 2x. [16,17] Note that some people claim 300% increases in carnitine levels, but that’s based on research done on infants, while the ~2x number was on adults. Needless to say, we’re excited for more research to arise on this compound. Expect a long post soon! Huperzine A is extremely underrated as a supplement. It prevents the breakdown of acetylcholine (ACH), one of the primary neurotransmitters of the body. By preventing the breakdown of ACH, more ACH is then available to the body. Since ACH is associated with learning and muscle contractions, more is better. However, the dose here is low – 25mcg is a fraction of what the focus-leaning supplements shoot for. That’s not the primary objective of Radiate, though. Rauwolscine is an interesting ingredient. Think of it as “yohimbine on juice”. In fact, it’s just a different form of the yohimbine molecule, known as alpha-yohimbine. 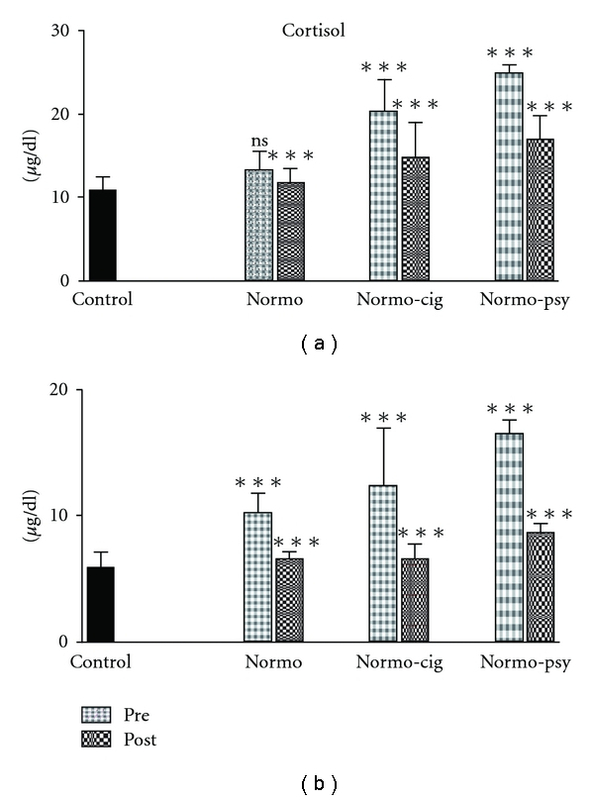 Theoretically, its action as an alpha-2 ANTAGONIST allows it to potentially help you “lose fat” by helping the body release fat from adipocytes more efficiently, but the main mechanism is that it slows the body from stopping the fat loss process, although we don’t believe it directly causes fat loss itself. Six in one hand, half a dozen in the other as far as we’re concerned. The limited evidence available so far shows that Rauwolscine may be more potent than yohimbine. However, this means that those with anxiety should be careful. For high-stimulant users, this is honestly the ingredient that is ‘make it or break it’ in terms of going to two capsules. We stick at one. Back to them peppers! Bioperine helps you absorb ingredients at a faster and more efficient rate. It’ll make the stimulants present in radiate hit you faster and harder. This is a smallish dose – we often see 5mg – and any more than that usually adds even more fiery “pepper” action, but we only notice that in the powders. Definitely a weird addition to Radiate. Methylcobalamin is just a fancy word for Vitamin B12. Unless you’re a strict vegan, it’s hard to be deficient in Vitamin B12, but still, we’re not going to complain about some B12! How’s that for a well-rounded, radiating blend? RXS Supplements has moved from powder to capsule yet kept it strong! If you’re interested to learn more, the story goes like this: Radiate was originally a DMHA-based fat burning powder drink. CJ was sent a few packets before the 2017 Arnold and fell in love! While Radiate powder was great, but the scoops were tough to measure out and it got to be a touch too strong, if anything! Meanwhile, much of the industry was getting away from DMHA… so RXS put out the new capsule version. They worked out a serious launch deal (which is no longer valid, but our current coupon comes close), and we posted it on our YouTube channel, not realizing what a hit it would be! Long story short? This wasn’t an affiliate offer (almost wished it would have been!! ), and we had no clue what we were walking into, but it turned out to be a massively successful product. But after our final review… we’re still sticking with one capsule at a time! Radiate is a freaking monster, and is one of the best single capsules we’ve ever seen, thanks to relying on strong ingredients that can fit — appropriately dosed — in a single capsule! It provides some of the best stimulants on the market and enough feel-good ingredients to keep your humanity in order. 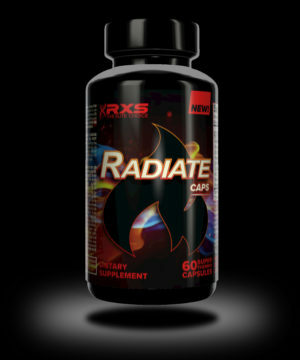 For those that feel like their energy dips on a diet and like a bit of heat in the mix, Radiate is the perfect solution. And if you don’t like heat, why are you still here reading about a product named RADIATE, for Pete’s sake?! Jokes aside, we do emphasis taking caution with a supplement of this magnitude – the rauwolscine is the “rate limiter” for many going to two capsules. The stimulants present in two capsules can put you a bit over the edge. If you know you’re sensitive to stimulants, one capsule for sure. Follow the instructions for once – just because it’s 150mg caffeine doesn’t mean it’s weak! 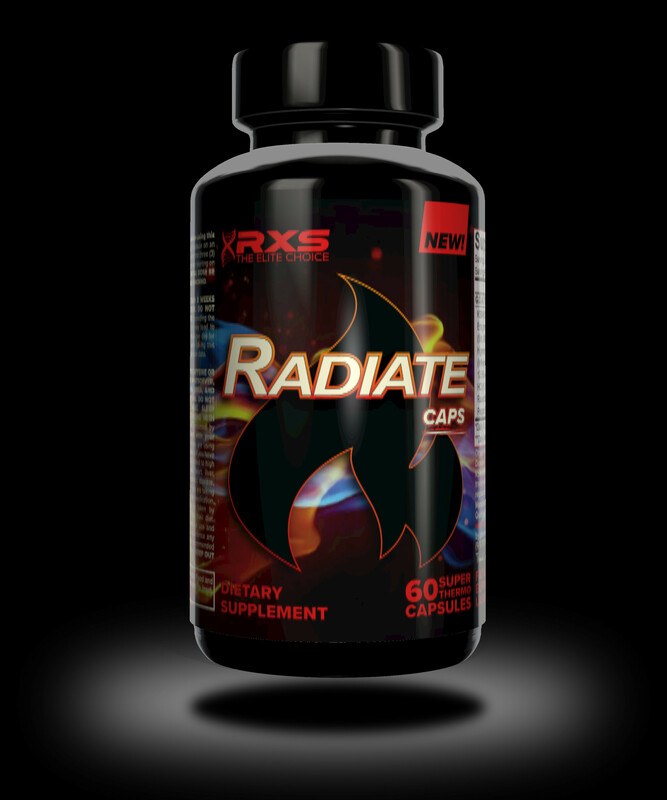 RXS Supplements has dropped a heat-seeking missile on their competitors with the new Radiate capsules. Barring a few ingredients that are dosed on the lower side (and they’re the ones that we don’t even care about in this formula), Radiate seriously gives you your money’s worth… especially with the coupon below. Just don’t take it too late at night or you’re asking for trouble! Use coupon code PRICEPLOW at RXSSupplements.com for 45% off! 5 Comments | Posted in New Products, Supplement News | Tagged 6-Paradol, Alpha Yohimbine, Ashwagandha, BioPerine, Black Pepper Extract, Caffeine, Dicaffeine Malate, Eria Jarensis, Fat Burners, Gamma-Butyrobetaine Ethyl Ester HCl, Grains of Paradise, Higenamine, Hordenine, Huperzine A, Infinergy, KSM-66, L-Dopa, L-Theanine, LeanGBB, Methylcobalamin, Mucuna Pruriens, N-Phenethyldimethylamine, Naringin, Norcoclaurine, Paradoxine, Piperine, Rauwolfia vomitoria, Rauwolscine, RXS Supplements, Theobromine, Vitamin B-12.